California has become “ground zero” for many large-scale employment-related class actions, and cases in the state are, in general, more likely to go to trial. This is because more than any other state, California is known for frequent changes to its labor and employment laws, and for compliance requirements that are often much broader than what employers see at the federal level. As well, California often serves as a bellwether for the evolution of state and national employment laws across the country, so smart companies need to stay on top of what is happening in the Golden State even if they don’t maintain a presence there. Because California is an epicenter of class litigation, especially in the area of state wage and hour laws, in recent years Constangy has developed a significant presence in the area of class action defense in California. 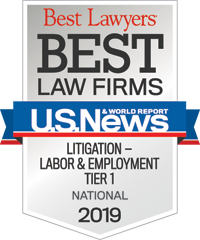 Our attorneys in Los Angeles and San Francisco have handled hundreds of class, collective, and other representative matters for companies across the state. Constangy’s California class action team is skilled in defending lawsuits in state and federal court including wage and hour class actions, arbitrations and administrative agency complaints, and allegations of harassment and discrimination. Our team of attorneys also has the experience to help companies with a California presence stay ahead of current requirements and avoid situations that increase the risk of expensive, complex litigation. Contain the impact of high-profile, multi-plaintiff litigation in California and across the country. Structure litigation with an eye toward maximizing success on appeal in state courts and in the Ninth Circuit. Explore suitable means for resolving complex cases on terms acceptable to our clients through the use of mediation and other forms of alternative dispute resolution available under federal and California laws. Plan and operate within a litigation budget. Constangy attorneys have represented several national hotel, retail, restaurant and grocery chains in more than two dozen California-based collective actions regarding employee classifications, overtime, ret periods and meal breaks. Represented multinational pharmaceutical and biologics company in class action alleging that pharmaceutical sales representatives were entitled to overtime pay. Represented warehousing company in class action alleging violations of the California Labor Code and the Federal Labor Standards Act including: improper recordkeeping, inadequate payment for hours worked including overtime, and failure to provide meal and rest breaks. Represented a large state utility in class action alleging that engineers for utility company were entitled to overtime pay. Helped a large food services company reach a favorable settlement in a class action race discrimination claim for failure to hire, failure to promote and failure to provide equal benefits and opportunities to African-American employees and applicants. Settlement included monetary value and institution of programmatic measures to increase the number of African-American employees. Represented a large supermarket chain in Cal-WARN class action on behalf of employees locked out during strike. Represented an international clothing retail company throughout litigation and negotiation agreements with U.S. Department of Labor (Rolene Otero) and State Labor Commissioner (Victoria Bradshaw) regarding labor law enforcement in garment industry. Represented a Fortune-500 insurance company regarding allegations of predatory pricing based on failure to pay overtime to improperly-classified customer care representatives. Represented a large grocery store company in a Title VII pattern and practice case filed by the EEOC alleging racial discrimination, harassment, and retaliation. Represented one of the nation’s largest agricultural operations in a class investigation conducted by the Los Angeles District Office of the United States Equal Employment Opportunity Commission regarding allegations of systemic race and national origin discrimination, harassment, and retaliation. Represented advertising agencies in multi-defendant wage hour class action brought by Screen Actors Guild members. Representing healthcare company in representative action filed under California’s Private Attorneys General Act (PAGA) regarding allegations of missed meal and rest periods. Represented a national retailer in a nationwide putative class action alleging race, gender, and national origin discrimination at more than 800 retail stores. Defended an international financial institution in a case filed by African American and Latino financial advisors alleging nationwide race discrimination, including disparities in account distributions, management opportunities, partnership/retirement agreements, business support, and overall compensation disparities. Representing a multinational biotechnology company in a class action involving reimbursement for employee cell phone, internet and home office expenses. Represented largely circulated metropolitan newspaper to confirm trial court's summary judgment ruling that an industry-wide commission sales plan is legal under California law. Represented and served as lead California counsel for a large banking institution in class action regarding MDL hybrid commission sales.